Pevonia's most advanced anti-aging and luxury skincare regimen gets a face lift! New luxury packaging, same formula, same size, same price! Effectively counteract the imprint of time to reveal a youthful complexion beautifully boxed and ready to give or keep for yourself! The ultimate 4-step anti-aging regimen to smooth lines and wrinkles, firm loose and sagging skin, and brighten and rejuvenate aged skin. For those with dry, mature skin with advanced signs of aging who want one of the most advanced anti-aging regimens on the market. This comprehensive set contains everything you need for anti-aging all in one ready-to-gift (or keep) luxurious gift box. Please see individual products for full usage and ingredients. This comprehensive set contains everything you need for anti-aging all in one ready-to-gift (or keep) luxurious gift box. How to Use: Foam a small quantity of Timeless Balm Cleanser between very wet palms, apply on face and neck. Work with wet fingertips. Rinse with warm water. Wipe face and neck with a cotton moist with the alcohol-free Timeless Repair Lotion. Then apply one to two pumps of Timeless Repair Serum on clean skin all over face and neck. Massage gently. Follow with Timeless Repair Cream applied all over face and neck. For all skin types. Use morning and evening. Pevonia's Myoxy-Caviar® Timeless Repair Cream is the ultimate anti-aging cream. It's like having several creams in one; a retinol cream, a vitamin E cream, a vitamin C cream, a caviar cream, and a neuropeptide cream (Escutox®). How much would all of these creams cost separately? Most companies have a caviar cream with a small amount of caviar. The Pevonia Myoxy-Caviar® Timeless Repair Serum is 10% caviar and 5% Escutox®. These pure ingredients are highly concentrated and give immediate results. Using the concentrate and cream duo gives you the highest and purest bioavailable form of caviar for skin use. The Myoxy-Caviar® products are formulated with up to 19 vitamins! Caviar contains iron, magnesium and phosphorus. It is needed by cells to utilize oxygen more efficiently and to improve cellular metabolism. It improves mitochondrial ATP which restores and recharges cells to function at a higher capacity. It contains phospholipids that are nourishing and restoring for the cellular membrane. Pevonia's Myoxy-Caviar® Timeless Eye Contour not only has pure caviar, but contains the latest anti-aging ingredients to target all aging eye concerns: dark circles, crepiness, wrinkles, puffiness, and hyperpigmentation. Department of Drug Sciences, University of Pavia, Italy. This opulent anti-aging treatment lavishes your skin with pure Caviar and a revolutionary blend of phyto-extracts: Escutox®. suppleness while reducing signs of aging. Hard lift-off mask for ultimate rejuvenation. Precise clinical test measurement: anti-wrinkle activity and firmness revealed exceptional improvement! Myoxy-Caviar® Timeless Balm Cleanser: Water (Aqua), Sodium Cocoyl Apple Amino Acids, Sodium C14-16 Olefin Sulfonate, Glyceryl Stearate, Cetearyl Glucoside, Caviar Extract, Polysorbate 20, Hydroxyethylcellulose, Anthemis Nobilis Flower Extract, Phenoxyethanol, Caprylyl Glycol, Ethylhexylglycerin, Hexylene Glycol, Citrus Limon (Lemon) Fruit Extract. Myoxy-Caviar® Timeless Repair Lotion: Water (Aqua), Glycerin, Sodium Hyaluronate, Allantoin, Sorbitol, Polysorbate 20, Caviar Extract, Citric Acid, Anthemis Nobilis Flower Extract, Phenoxyethanol, Caprylyl Glycol, Ethylhexylglycerin, Hexylene Glycol, Citrus Limon (Lemon) Fruit Extract. Myoxy-Caviar® Timeless Repair Cream: Water (Aqua), Squalane, Carthamus Tinctorius (Safflower) Seed Oil, Glycerin, Caviar Extract, Cetearyl Glucoside, Hydrolyzed Hibiscus Esculentus Extract, Dextrin, Algae Oligosaccharides, Sorbitol, Caprylic/Capric Triglyceride, Thioctic Acid, Retinyl Palmitate (Vit. A), Retinol, Calcium Ascorbate (Vit. C), Tocopheryl Acetate (Vit. E), Ethylhexyl Methoxycinnamate, Dimethicone, Glyceryl Stearate, Phenoxyethanol, Caprylyl Glycol, Ethylhexylglycerin, Hexylene Glycol, Anthemis Nobilis Flower Extract, Citrus Limon (Lemon) Fruit Extract. Myoxy-Caviar® Timeless Repair Serum: Water (Aqua), Caviar Extract, Glycerin, Hydrolyzed Hibiscus Esculentus Extract and Dextrin, Algae Oligosaccharides, Polysorbate 20, Anthemis Nobilis Flower Extract, Carbomer, Phenoxyethanol, Caprylyl Glycol, Ethylhexylglycerin, Hexylene Glycol, Sodium Citrate, Citrus Limon (Lemon) Fruit Extract. Pevonia Natural Skincare has given its award-winning Myoxy-Caviar® Collection a major face lift. The opulent caviar products are known as one of Pevonia’s most advanced anti-aging and luxury skincare regimens. They contain an unprecedented concentration of pure Caviar Extract and Escutox®, a Pevonia-proprietary neuropeptide that delivers a natural smoothing result on facial lines and challenges other non-natural treatments on the market. These ingredients and many others work synergistically to turn back the clock and restore a youthful radiance in the skin. The new look brings a more elegant, modern packaging to a classic product that is still a best-seller for the brand. 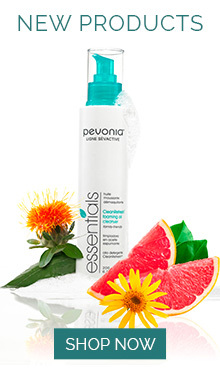 Pevonia prides itself in constantly refining products and bringing new innovations to its customers. The new and improved Myoxy-Caviar® Collection reflects this commitment by giving an adored formula a fresh new twist. Consisting of five products, the Myoxy-Caviar® Collection is a full line of defense against aging skin. These include the Timeless Balm Cleanser, Timeless Balm Repair Lotion, Timeless Repair Serum, Timeless Eye Contour and Timeless Repair Cream. Loaded with amino acids, vitamins and minerals, Caviar is a source of nutritive elements that are key to skin cell oxygenation and regeneration. It helps to expedite and strengthen the natural production of collagen, in turn plumping up the skin, for a younger, smoother appearance that is radiant and full of vitality. Pevonia® will accept returns or exchanges for any Pevonia.com purchase that is returned within 30 days of the PURCHASE date. All returns must be pre-approved by customer service. Return acceptance (for refund or exchange) is at the sole discretion of Pevonia. Refunds will be provided in the form of a store credit for the equivalent amount of the product purchase price. Your store credit can be redeemed with any future purchase. Email [email protected] or call us at 1-800-PEVONIA (738-6642) to obtain your RMA (Return Merchandise Authorization). Please reference your original order and note the items that you wish to return and the reason for the return. We will provide you with an RMA number (valid for 30 days from issue date). Pack the item along with the original order documents. Write the RMA number on the outside of the package. Once you follow the above steps, your store credit or exchange will be processed within 21 days of receipt. Thank you for choosing award-winning Pevonia Botanica natural skincare.